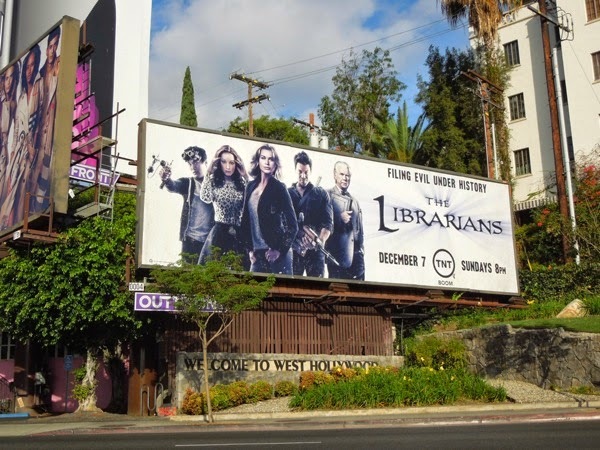 Who you gonna call when fighting the forces of evil, why The Librarians of course. Wait, what?!? 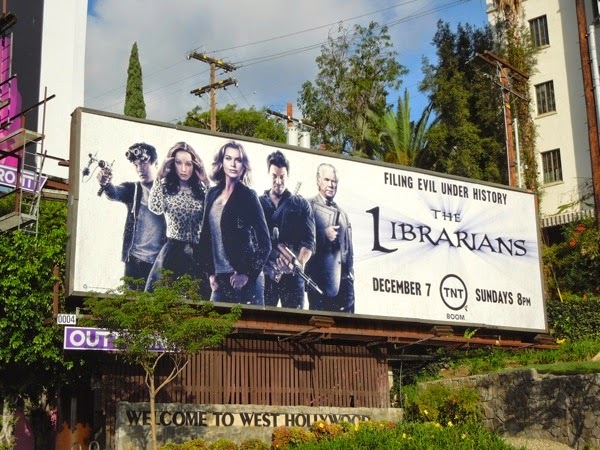 TNT's new weekly TV series is based on their made-for-TV movie franchise The Librarian starring Noah Wyle, which has already spawned three movies, The Librarian: Quest for the Spear debuted in 2004, followed by 2006's Return to King Solomon's Mines and 2008's Curse of the Judas Chalice. 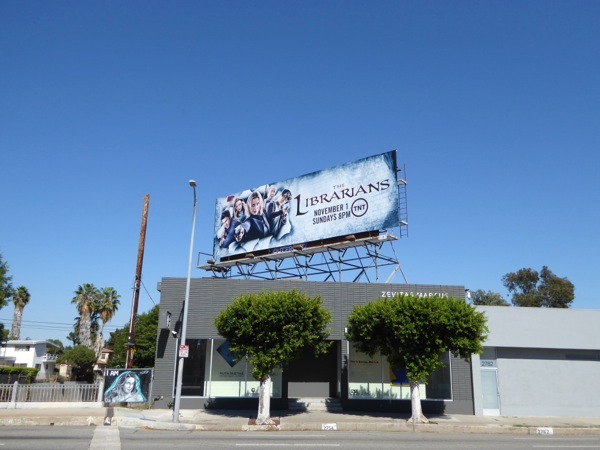 Ten years later and The Librarians, complete with original and new cast members led by Rebecca Romijn, continue to guard ancient treasures, hunt relics and protect the outside world from supernatural forces and powerful magical objects. 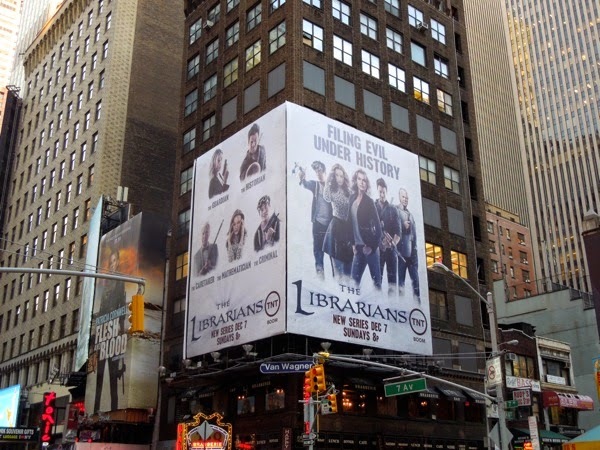 The episodic series sounds like a mash up of Indiana Jones, Warehouse 13, and more genre shows than you could shake a book at, and the ad creative has a slightly dated Buffy the Vampire Slayer feel to it (which may be what TNT were hoping for). 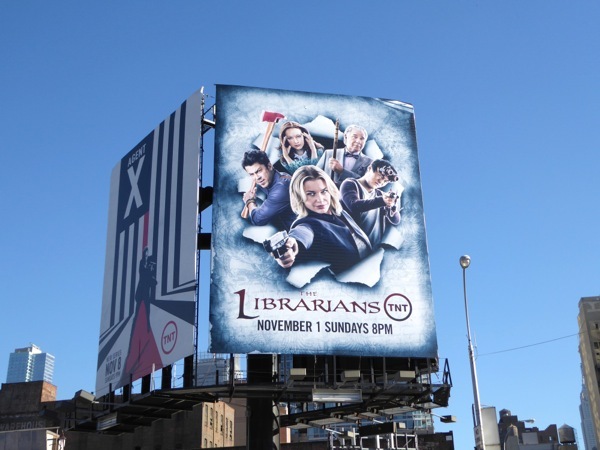 The corner wall billboards for The Librarians were spied near Times Square in New York City on November 3, plus along West Hollywood's Sunset Boulevard on November 12, 2014. Only time, and viewers, will tell if this is a buried treasure worth uncovering, or whether it's best to lock it away in a dusty old vault to protect all mankind. 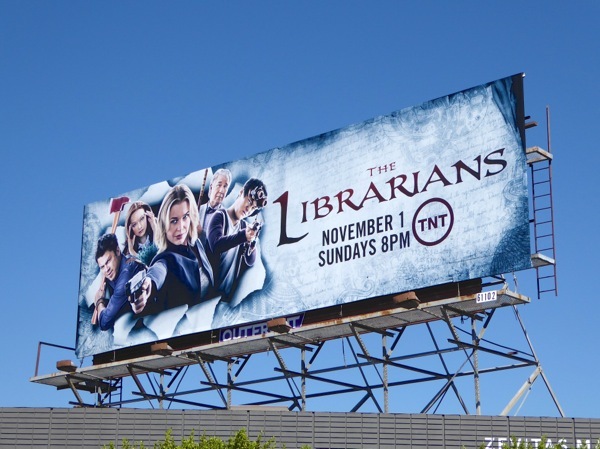 UPDATED: The Librarians are back for a sophomore season with this cool ad creative with Rebecca Romijn leading the charge. 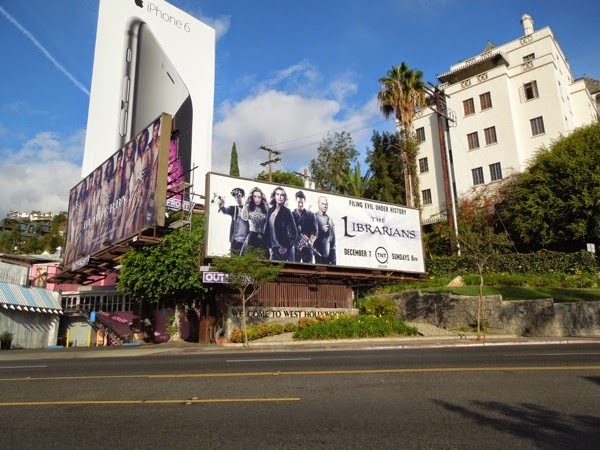 This season two billboard for the TNT TV movie spin-off was snapped along La Cienega Boulevard on October 11, 2015. 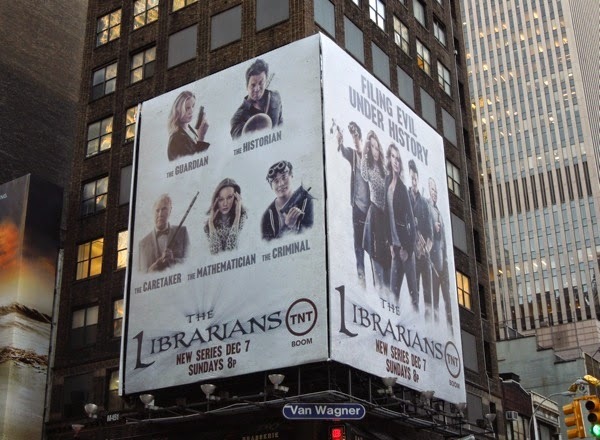 UPDATED: Here's also extra outdoor support for the second season in the skies of New York City. 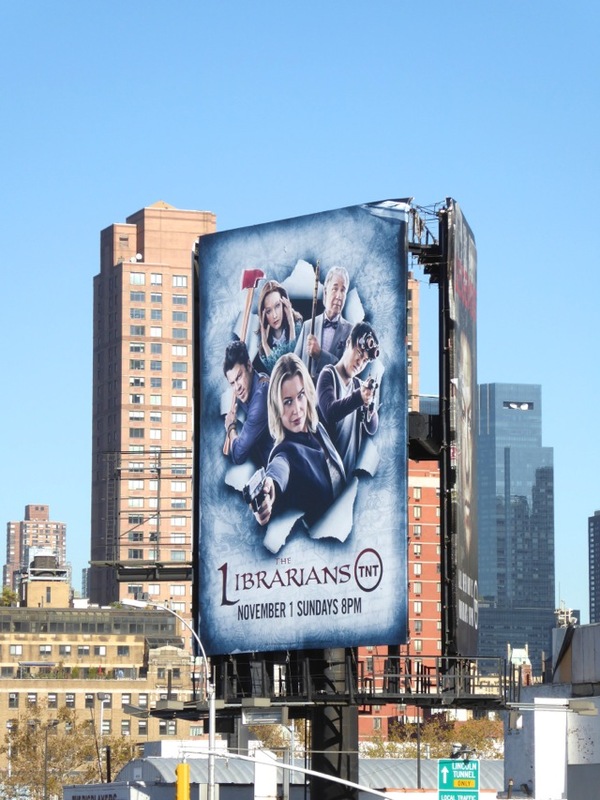 This portrait billboard was snapped along 11th Avenue opposite the Javits Convention Center on November 3, 2015.